Abdullah Abdullah exemplifies a political chameleon in a country tortured by wars and violence. 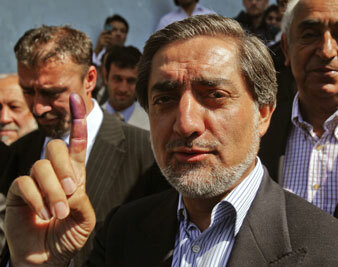 Abdullah Abdullah shows his finger marked with paint after voting at a polling station in Kabul, Thursday, Aug. 20, 2009. Abdullah Abdullah, the most powerful challenger to Hamid Karzai in the presidential elections in Afghanistan, argues on his campaign website that “there can be no greater priority than regaining the trust of the Afghan people,” a trust he now claims is being squandered again in voter fraud by his rivals. While the votes are still being counted and the Electoral Complaints Commission is urging candidates not to rush into predictions and accusations, Abdullah, an ophthalmologist by training, might well be a little more forthcoming and expansive about his own history and what that would mean to his turbulent country should he be elected, or even force Karzai (no democratic paragon either) into a bitter runoff. A political chameleon (a widely encountered species in Pakistan and India also), Abdullah, born in 1960, was a close adviser to Ahmed Shah Massoud, a legendary Tajik mujahedeen commander from the Panjshir Valley who served as defense minister of the government set up after the fall of the pro-Soviet leader, Najibullah. Abdullah was also an informal chief spokesman for the loose coalition of mujahedeen warlords known as the Northern Alliance, which had driven Soviet forces out of the country with considerable American help. Then, with Washington’s back turned, they began fighting among themselves, laying waste to large swaths of Kabul and creating so much havoc and violence in the countryside that by 1995-1996 Afghans greeted the arrival of the Taliban with relief. Trust of the people? The mujahedeen “government” of the post-Soviet, pre-Taliban 1990s was known for its efforts to deprive women, particularly urban women, of the gains they had made under communist governments. When the United Nations Fourth World Conference on Women was held in Beijing in 1995, Afghan women were forbidden to send a delegation. In the Afghan countryside, women were not safe from either civil war or sexual assault. One of the most conservative of the mujahedeen leaders, Abdul Rasul Sayyaf (who tried to ban all female journalists from his news conferences), not the Taliban, was the first to welcome Osama bin Laden to Afghanistan, according to Kathy Gannon, a Canadian who reported from Afghanistan for eighteen years and wrote one of the best books on the events of recent decades, I Is for Infidel. Abdullah was officially the spokesman of the mujahedeen government’s defense ministry in Kabul from 1992 to 1996, when the Taliban, a very different movement than it is today, took control of the capital. Abdullah then became a roving global spokesman for what the mujahedeen called their exiled Islamic Republic of Afghanistan. He appeared to be cut out for the task, as all of us who encountered him noticed. As Kabul was falling to the Taliban, Abdullah was telling reporters that the Talibs had been repulsed; but he knew the city was lost, and he was actually “getting ready to run,” Gannon said. He wasn’t gone for too long. After the United States invaded Afghanistan in 2001 and essentially gave Kabul back to the murderous mujahedeen, Abdullah became part of the team charged with rebuilding the country. Later, when a transitional government was formed and an election held, he was Karzai’s foreign minister. Now he is his most outspoken foe. Abdullah’s ability to resurface in any political climate, along with other mujahedeen figures, is symbolic of the situation that has alienated many Pashtuns, the largest and now most mistrustful ethnic group in Afghanistan, a point made by Amin Tarzi in a collection of scholarly essays, The Taliban and the Crisis of Afghanistan. After 2001, the Pashtuns got a Pashtu president, Karzai, but he had no militia of his own and has been surrounded, obstructed and compromised by Tajik and Uzbek warlords. Enter Abdullah, all things to all men. His official bio says that he was born in Kabul to a devout Muslim family and that his father (a former Pashtu politician) was from Kandahar, a Pashtun/former Taliban stronghold, where Abdullah needs votes. In an election year, the bio doesn’t mention that his mother was a Tajik.